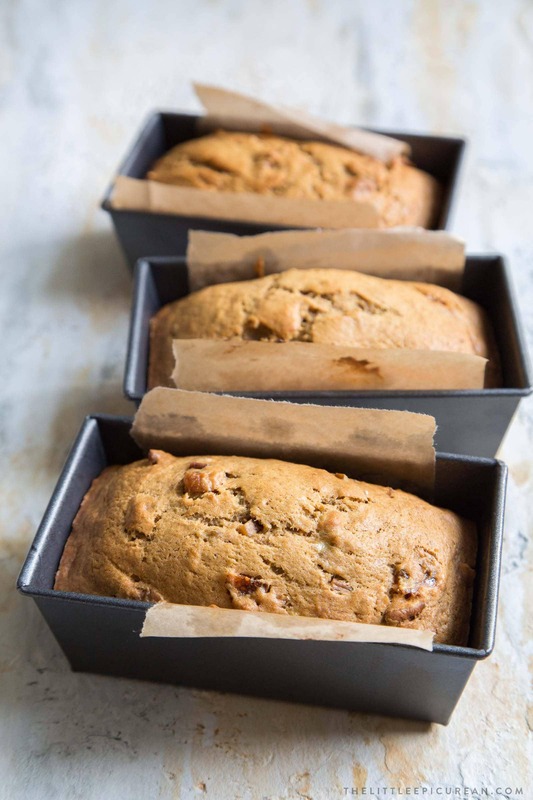 This autumn banana pumpkin bread is studded with chopped calimyrna figs and toasted pecans. Last week was tough. I was biting my nails, my palms were sweaty, and my throat was irritated from all the sudden outbursts (yelling, cheering, sounds of defeat). What caused all this catastrophe? The World Series. I’m a big fan of baseball. It’s the one sport I actually understand and enjoy watching. I love the details, the intricacies, heck, I even like analyzing the stats involved. Alex and I were both born and raised in Los Angeles. And as such, we bleed Dodger Blue. Let’s face it. Houston Astros played better. As much as I LOVE the Dodgers, Astros clearly deserved it. You’re asking, how did we survive last week’s game 7? It wasn’t easy, but giant slices of this banana pumpkin bread with dried figs and toasted pecans helped ease the heartbreak. Banana bread is a staple in my kitchen as soon as the weather cools down. There’s something so comforting about a slice of warm banana bread with a mug of coffee or tea. It’s a treat you can enjoy anytime of day. 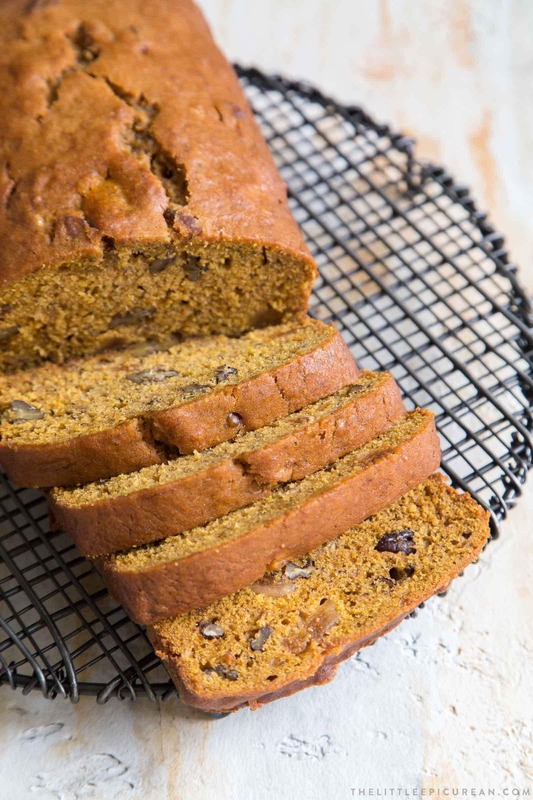 This autumn banana bread is mixed with pumpkin puree. The pumpkin puree adds moisture without additional sweetness. I added chopped Calimyrna figs and toasted pecans for my mix-ins. Of course, you can sub in your favorite dried fruits and toasted nuts. This recipe makes two standard 9×5-inch loaf pans or six 6×3-inch mini loaf pans. You can mix and match, as well. I kept one 9×5-inch loaf pan for myself and gave away three 6×3-inch mini loaf pans. These make for fabulous holiday food gifts. 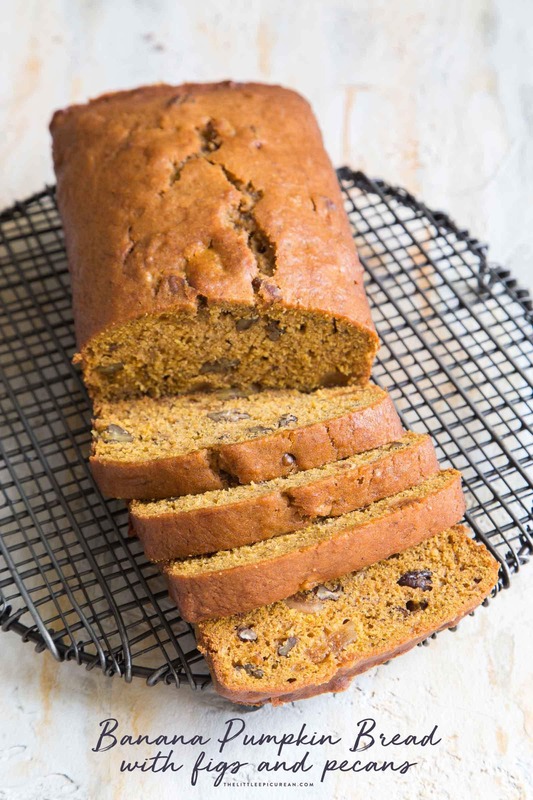 The banana pumpkin bread stays moist days after baking. Yield: makes two 9x5 inch loaf pans, or six mini 6x3-inch loaf pans, or a combination of one 9x5-inch and three mini 6x3-inch loaves. Preheat oven to 350 degrees F. Grease loaf pans and line with parchment paper. In the bowl of stand mixer fitted with a paddle attachment, beat together coconut oil, sugar, brown sugar, and molasses until smooth. Add eggs one a time and mix until thoroughly incorporated. 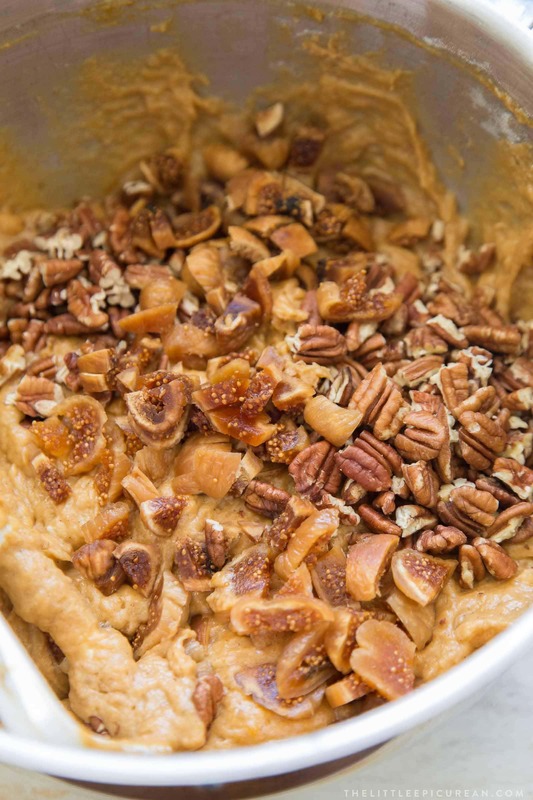 Mix in pumpkin puree and mashed bananas. In a large bowl, whisk together flour, baking soda, baking powder, salt, cinnamon, and nutmeg. Add dry flour mixture to mixing bowl in two additions. Mix on low speed until there are no longer any dry streaks of flour. Fold in pecans and figs until well distributed. Divide batter among prepared loaf pans. Bake mini loaves for 40-45 minutes until toothpick inserted in center of bread comes out clean. Bake standard size loaves for 50-55 minutes until toothpick inserted in center of bread comes out clean. Allow bread to cool in pan for 10-15 minutes before unmolding. Allow bread to cool to room temperature on wire rack. Store banana pumpkin bread in an airtight container at room temperature for up to three days. For longer storage, bread keeps in the fridge for up to a week.